The boy stands there in a world with no other people. He looks around and all he see’s is a big glass wall that shows a mirror reflection of the world around him. Nothing, there is nothing in sight. 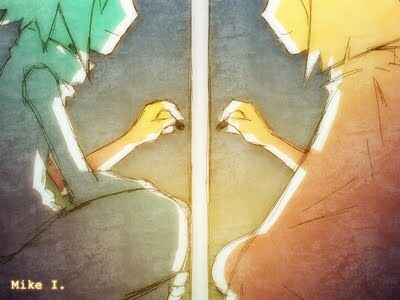 There is only his reflection in the glass wall…and on the other side of the glass wall, stands a girl… The girl seems to be in the same situation, she sits beside the glass wall hugging her knees staring blankly into nothingness. The boy approaches the wall and knocks on it. The girl seems not to hear the knock. He starts to shout now…still no sign of reaction from the girl. He sighs and looks down with defeat. The girl finally see’s the boy. She stands up and looks at him. He looks up and smiles to see that the girl has noticed him. He starts to talk: but on other side of the wall there is no sound of his voice. She makes a gesture to him showing she cannot hear him. The boy frowns and thinks: if she can’t hear me…how am I supposed to talk to her? The boy gets the idea of writing on the wall. He pulls out a black marker and writes on the wall. The girl tilts her head and makes a gesture showing she can’t understand what he is writing. He looks at the writing from his side and thinks that it looks fine to him, why can’t she read it? The boy suddenly realizes that his writing is backwards to her. He laughs to himself and scratches out his writing; he starts to write backwards with a slight smile. “Yes” She draws a girl figure on the wall. It appears to be an altered figure of the girl with a super model body. “You don’t even look like that…there is no reason to lie, you look beautiful just the way you are!” He draws what she really looks like next to her drawing, and then writes the word “perfect” next to the one that looks most like the girl. As day goes by they never leave the glass wall from each other. They continue to write back and forth and draw many new pictures for each other enjoyment. “It is!? I didn’t know!” The boy draws a sad face. “Please, I would like to know!” He draws a smile face then. The girl looks at the amazing drawing of the cake, the boy has very nice details in his drawing skills, and she thinks that she could spend all eternity just watching him draw, and that would just make her happy. “No, no, no! I’m serious! This is the best birthday ever! I’m not alone!” Then draws a happy girl hugging a boy. The boy smiles and nods his head. The girl looks down and frowns…. The boy swiftly sends his fist through the glass wall with all the force and strength he has left. The sound of glass fills the whole world at that moment. The boy’s fist broke through the glass. The girl looks to the fist that has made a hole to the wall and starts to reach for it. The boy is crying from all the pain he is in the girl is about to touch the hand when all the glass shards send back into the air and start reforming themselves back to where they originally where on the wall. The glass is going so fast that it starts cutting the boys hand even more then before. The boy screams and pulls his hand back. The girl Covers her eyes and also screams. The glass wall reforms itself back to its natural state. It was as if the boy never even hit the glass. The boy falls to the ground and lays there in defeat has his hand continues to bleed. The girl stays there and constantly tries to get the boys attention. The boy finally stands up after a long day of rest and walks away from the glass wall. She pounds on the wall trying to get his attention. The boy continues to walk away and gets so far that he cannot be seen from a distance. The girl lies down on the ground and starts to cry. Yelling for the boy to come back. Many days go by and the boy does not return. But the girl still remains by the wall waiting for the boy. The boy makes a gesture showing that he cannot use his hand to draw anymore. The boy stands up and walks away one last time.